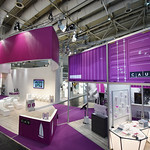 foto album "CAU @ Hannover Messe 2017"
The Science Communication Lab specializes in providing innovative visual communication specifically for the sciences and for complex, explanation-intensive subjects. The innovation of The Science Communication Lab is that it combines classical disciplines of science communication such as journalism and public outreach activities with advanced design and visualization skills in interactive technologies. Numerous high-profile awards such as the German Design Award 2016 confirm this. As a laboratory The Science Communication Lab sees itself as a research-based and experimental institution that developes new and innovative forms of representation to meet the increasing demand of visualizations of abstract topics or complex product developments. The Science Communication Lab is a spin-off of the Muthesius Academy of Fine Arts and Design and was honored with the innovation award of the city of Kiel 2017. Interactive Poster: Ocean Observation from SCIENCE COMMUNICATION LAB on Vimeo.